Telling the Company Secrets – Defensive Publishing Pt. 2. Over the past few decades many corporations have seen exponential increases in costs associated with their IP portfolio and an increased drain on technical resource to support a “patent everything we invent” approach. Increasingly defensive publishing is being accepted by more industries and is becoming commonplace in companies where IP and the costs associated with it were once of little concern. 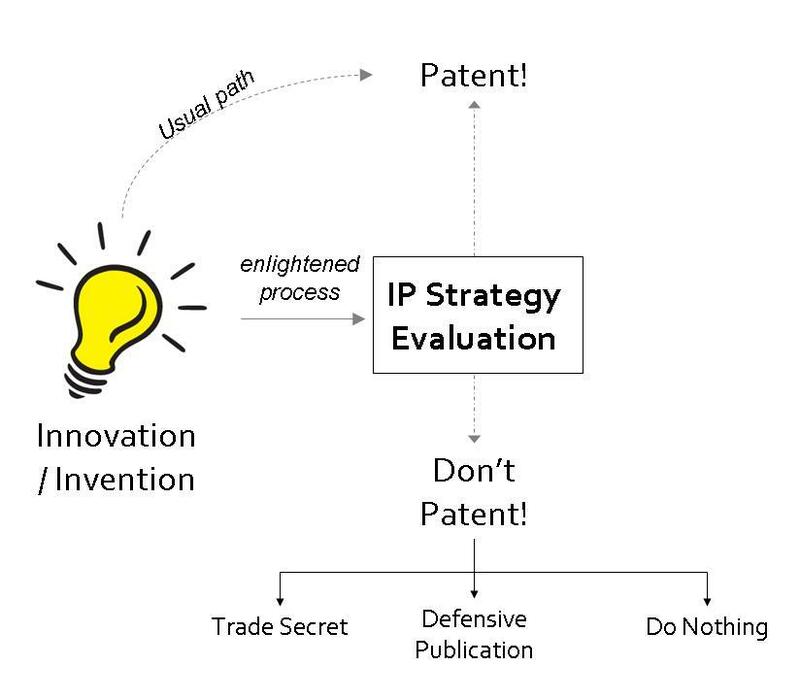 In the first post of this two part series we examined routes for defensive publication, here we will discuss how defensive publishing can replace several common patenting strategies: cost limitation, picket fencing, freedom to practice, trade secrets, and patent races. 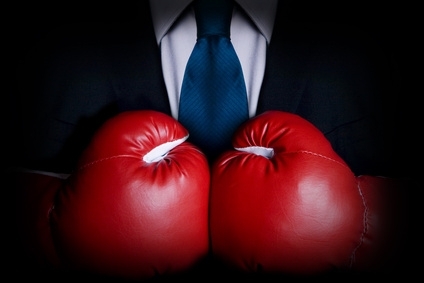 Perhaps the most common reason for companies to choose defensive publishing strategies over blanket patent tactics is to limit the cost of maintaining the portfolio. By simply defining inventions into either core patents and supporting IP many companies can offset their legal costs significantly while at the same time having limited if any effect on the overall strength of their patent portfolio. For a company utilizing a defensive publishing strategy the supporting or fringe IP could be published in trade journals or commercial publications to protect against competitor ownership while limiting cost of maintaining the real patent portfolio. Picket fencing or mine-fielding is the process of filing variant patents around a central patent core. When executed properly, the picket fence creates a high barrier to entry for competitors and greatly restricts their ability to practice in spaces adjacent to the core inventions. In most cases the picket fence patents are of much weaker quality and, if the central patent is well-executed, have limited value unless there is the intent to produce the invention described in the patent or if the picket patent can be delivered independent of the central patent claims. Defensive publishing alternatives to picket fencing practices follow the same systems as cost limitation strategies where possible inventions are described as either core or peripheral. Peripheral inventions are then published into the public domain, preferably in an easily searchable database and even more preferably in a publication likely to be discovered within a patent office examiners search report. The point of picket fencing is primarily as a deterrent and so public domain disclosure in hidden or obscure publication routes is of limited use within a defensive framework. Often corporations will make their profit, not by inventing something new, but by taking a fringe or known products mainstream. But what happens when that fringe product is really really fringe? Consider this scenario; Company A discovers an unpatented widget on sale in Korea they believe it has the potential to be a blockbuster product in the USA. They begin developing the product for a US launch, modifying the designs, building manufacturing capability and planning the marketing strategy. An IP screen late in the process identifies a recently published patent from Competitor B which describes the popular widget and claims ownership of the invention. How can this be? The product has been on sale in Korea FOR YEARS! Over the next few months Company A rallies their legal department to plan their defense. A supply director delays approving a production line until “after the legal issues have been resolved” and the feeling from the business as a whole is frustration. Fundamentally the patent system isn’t broken, Competitor B’s claim over the invention is void and eventually will be rescinded but the time and cost to Company A is significant and real. In this case had Company A employed a defensive publishing strategy known as prior art elucidation they could have avoided the frustrating scenario outlined above. Given the emergence of ‘patent trolls’ and likely presence of an aggressively patenting competitor in any industry using defensive publishing to ensure freedom to practice can be very important. The cause of (and solution to) this scenario lies within the patent office who cannot possibly be aware of all prior art and so often will grant patents on inventions that are within the public domain. Ensuring freedom to practice by disclosing the prior art into easily found and searched publications is one way of improving the chance of any future competitor filings being rejected and thus limiting the potential defensive cost. The most suitable although not the most common approach is to utilize commercial publications for the prior art elucidation. Companies such as ResearchDisclosure.com are very well suited to prior art elucidation due to their agreements with IPO member states which improve the chance of the information being found during the search process. The use of defensive publishing within the context of a patent race is an interesting strategy. Basically the approach allows a company to decide how it wishes to compete, on first to patent terms or on first to market terms. The scenario of a patent race between corporations occurs when a common technology goal is defined and the experimental path to the goal is well-defined. In this instance the companies developing the technology are making an all in bet. Only one company is likely to succeed and the loser is likely to face significant setbacks to its development capacity. By applying a defensive publishing strategy that pushes non-core inventions into the public domain rather than building a patent case the company can get a better return on its research investment and give itself a better chance at winning its all-in bet. Taken to the logical conclusion a company may even choose to publish everything it discovers, as is discovers it, in an attempt to remove any chance of a competitor ultimately owning a strong patent in the field. In this case the company is banking on a level playing field being a better competitive option than the chance of winning the all-in bet. The use of patents to protect IP that was traditionally kept as trade secrets has increased over the past few decades. This is possibly due to the mobile nature of the modern workforce and internet publishing making trade secrets almost impossible to keep. This trend however has given rise to the problem of the unenforceable trade secret patent. Usually this situation arises when a novel process is patented by a company but the patented process produces an indistinguishable product from the prior art. In this case the patent is close to useless and in the worst case gives away any competitive advantage that the technology advance had generated. The system for defending trade secrets however results in one piece of litigation risk that can be avoided through the use of defensive publishing demonstrated by the following scenario; Engineers at Company A develop a novel processing technique to make their widget at half the cost of the old process. The process leaves no fingerprint other than on the accounts department i.e. the new widget is indistinguishable from the old widget. The lawyers at Company A rationalize that to patent the new process would be of less value to the company than to keep it a trade secret and steps are put in place to maintain this. Five years later a patent on a widget making process is published from Competitor B. The lawyers advise that Company B’s process is substantially the same as Company A’s and that they should prepare some sort of legal defense to ensure that production can continue if a legal challenge were to come about. Fundamentally, the trade secret process is not flawed, Competitor B’s claim over a process that has been used by Company A for years is void, but the cost of defending a process they have always used is real and annoying. In this case the use of a defensive publishing strategy known as hidden disclosure may have advantages. 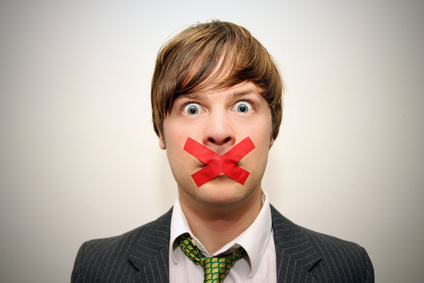 Methods for creating hidden disclosure are quite varied but essentially the approach is to place the trade secret into the public domain in a manner that, while being entered into the record as a matter of fact, does not create enough interest or is not accessible to enough people to fully surrender the invention. Methods that achieve this include using the procedures of the patent system itself (withdrawn patents etc) and the use of non industry publications. Maybe even the local classifieds could be a sufficient enough publication to cause a competitor to drop a costly lawsuit? This entry was posted in Portfolio management, Strategy, Thinking and tagged IP, Legal, Management, Patents, Strategic publishing. In the last week we’ve discussed using Defensive Publications as a strategy to reduce the overhead associated with patent filings. However, we’ve never really given a detailed explanation of how this concept fits in an over-all intellectual property (IP) strategy for an innovating organization. Often, in the excitement of creating new products from an innovation or invention the tendency is to rush directly from idea / proof of principle to the lawyers’ office to begin drafting patents. Why is it so ingrained in a corporation to patent any new idea or process? Perhaps for some it is because patents can be used as a measure of R&D productivity, effort, or inventiveness. Patents also offer a chance for recognition for inventors and the company amongst their peers. Finally, those responsible can find comfort in the fact that the organizations interests are protected from competition. However, as expressed in the prior posts patents can be an expensive way to protect intellectual property – besides the obvious cost of filing the documents across the globe the organization must also consider the financial cost over time to maintain the portfolio, the value of the time the legal department will spend managing the portfolio, and the impact on R&D productivity as resources are directed to fulfil the data and testing requirements (often outside of the focus of any related project). The filing fees for a patent can pale in comparison to the loss in productivity and resources that might be incurred by a simple patent filing. For resource constrained companies a better process is needed. The figure above shows the process that might be used by enlightened organizations to manage the intellectual property strategy process. Rather than rushing from idea to patent, as often occurs, the identification of a new idea or innovation should lead to a strategic discussion. During that discussion a number of criteria might be used to evaluate the idea, leading to several possible outcomes. Competitive Intensity (CI): the position of the organization in the market and in relation to its competitors, as well as market pressure, can dictate to a large extent the need to protect or the possibility of using a less resource intensive mechanism. In highly competitive spaces patenting may well be the best path forward, in spaces where a company has market leadership with few threats, disclosure (keeping the playing field level) may well be sufficient. Disruptive Potential (DisPot): the likelihood of the innovation to transform the market or industry should also be taken into account. Disruptions creating new consumer benefits should be viewed differently than innovations that benefit only the company. For example, for a company that has a market leading position due to brand or scale an innovation allowing cheaper product manufacture may not require patent protection. Only if competitors had exclusive access to the IP would a real threat be created. In this case a level playing field may not hurt the market leader – the real competition is occurring on other fronts. Strategic Importance (SI): for innovations in non-core areas the best IP strategy can vary depending on whether those areas may later become important or if protecting them from competition is a strategic necessity. This may also include whether technical innovations should be fully and comprehensively exploited or given a more cursory exploration to understand potential and obtain minimal protection or establish minimal freedom-to-operate. Reverse Engineering Potential (REPot): For process, manufacturing, or chemical innovations where the consumer or competitor will see little difference in the product, the question of whether the innovation could be externally discovered through practice of the innovation must be considered. Commercialization Viability (CV): The likelihood of commercialization of the innovation should also be considered. Also, if the innovation is likely only to enable another innovation or invention the resource dedicated toward protecting it may not need to be as highly prioritized. How can these criteria be used then to determine a path forward? For situations where a very low IPROI is determined, simply doing nothing may be an option. If the innovation is not in a competitive arena, is not on-strategy, or is not enforceable, then the best use of resource could be to let the idea go. For instances with a moderate IPROI the decision to patent, hold as a trade secret, or defensively publish can be determined according to the relative weight of the factors. 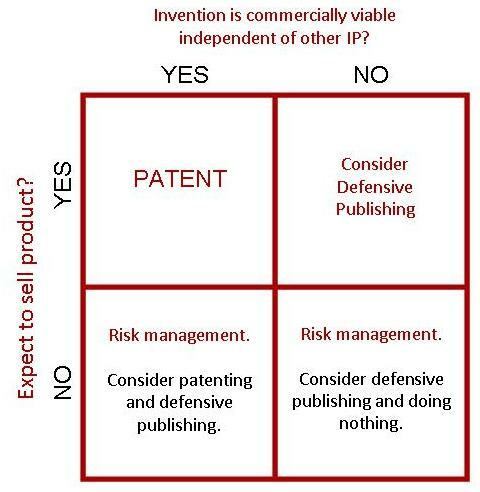 An innovation found to have high strategic value and commercialization viability but low competitive intensity might be best protected through defensive publication, while in the opposite instance (high competitive intensity with high commercialization viability and low strategic importance) the value of a patent may be recognized. For projects with very low reverse engineering, potential trade secret protection could be the best route. For scenarios with a very high IPROI going forward with a patent would almost always be advisable, though of course a number of instances where this is not the case can be imagined. 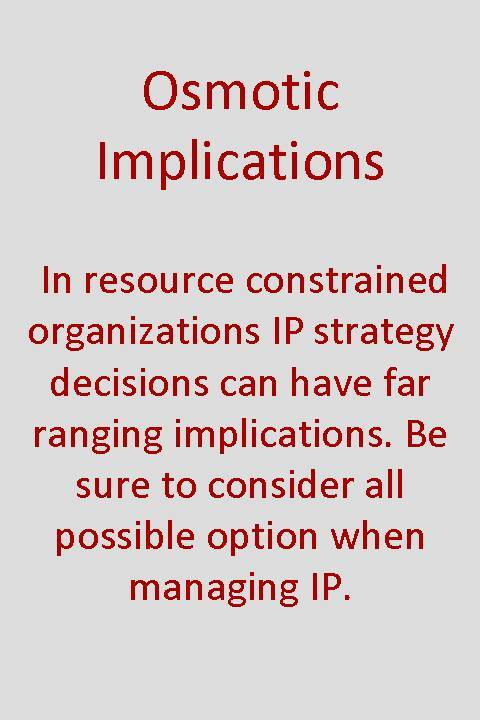 Obviously the area of IP strategy is a high importance to many organizations, however much of the focus in recent years has been on creating and managing large IP portfolios. For the osmotic innovator a better strategy is needed; one that balances resource scarcity with the need to create value for the company. This entry was posted in Portfolio management, Strategy, Thinking and tagged Idea management, IP, Legal, Management, Patents, Strategic publishing. Strategic publishing is related to intellectual property rights in that its use is intended to clarify and ensure the inventors right to use their discovery or invention without the need for legal defense. Within a corporate IP portfolio strategic publishing can be used in both a defensive and offensive manner. Over the past two decades there has been a marked increase in the use of strategic publishing especially from the high tech electronics industries who have promoted its use to control their ballooning legal costs. Globally, more companies are beginning to use strategic publishing in its defensive form as part of their IP management process and as a mechanism for driving resource demands out of their innovation programs. Within the strategic publishing field by far the most common form is defensive publishing. Defensive publishing is simply publishing into the public domain an invention or discovery with the express purpose of making it non-patentable. The rationale for choosing defensive publication over patent filing can be complex and varied but within large companies the driver for this is generally one of three rationales, cost limitation, non enforceability and IP landscape clearance. In order to be useful as a defensive publication the publication must meet a few simple criteria. The publication must be accessible to the public. There have been lawsuits arguing the definition of accessible but generally all media that is shared with people outside the company is suitable including company sponsored literature provided it is circulated externally. An example of this was IBM’s Technical Disclosure Bulletin which was published until 1998 with the express purpose of preventing IBM’s competitors patenting inventions it had developed but had chose not to pursue. In order to be useful the publication should be timely. The creation of prior art is very much dependent on when it is published relative to any patented invention. Fast and clear publication is as important to a defensive publishing strategy as it is for a normal patent strategy. The date of publication must not be ambiguous. This can be especially important if the proposed publication is web based which can be open to challenge. The best defensive publication strategies utilize printed and searchable journals. Where to choose to disclose the invention is very much dependent upon the final publication strategy that is chosen but a number of more common options are listed below and assessed against the general criteria above. Publication of disclosures in company literature or the company website has the advantage of being simple and under the control of the company but fails against the accessibility and ambiguity tests described above. In trying to block a future patent claim or avoid having to defend a process or invention in court proving publication date on a company website is unlikely to prevent any case incurring significant legal costs. Company promotional literature also cannot benefit from anonymity which can be important for some defensive publishing strategies. Company report series have been used by a number of corporations in most cases very successfully including IBM’s Technical Disclosure Bulletin, Siemens’ Zeitshrift among others. The benefits and drawbacks are similar to those of company promotional literature. So called White Papers are often published (usually electronically) in order to disclose information. Their limited circulation means that they often are not suitable as part of a defensive publication strategy unless the three requirements of the previous section can be sure to be met. Grey literature is the body of presentations, trade posters and the like that companies generate as part of the routine industry networking process they are involved in. Grey literature is very rarely monitored or routinely documented or archived and so does not generally serve the purpose of a defensive publishing strategy. In cases where grey literature has been used as prior art it has generally been accompanied with dated filing with company attorneys which is not generally enough to avoid legal challenges going forward. There are a number of commercial publications that function specifically as a method for disclosing inventions. The longest running of these is the journal Research Disclosure (http://www.researchdisclosure.com/) which publishes both in paper and electronic form any research that a company may wish to bring into the public domain. Research Disclosure does not require that the author is identified and so anonymous disclosures can ensure that a company’s longer term strategy is not compromised. The relatively new intellectual property library IP.com (http://ip.com/) is similar to Research Disclosure in many ways but has a stronger focus on obtaining agreements with patent regulators to promote the use of their library as part of the routine prior art search conducted before the granting of any patent. This facet allows defensive publishing an additional strategic advantage of possibly being used to clear IP space in an area where a competitor is active or increasing the likelihood of more obscure prior art being cited in any future search results. More recently other commercial publication portals including Research Disclosure have begun including these agreements within their systems. One option for disclosing inventions is to publish in peer reviewed journals. While meeting much of the criteria required of a defensive publishing strategy one major drawback is the lack of control over the timeliness of the publication which can often be delayed for months or even years. Unless there is a higher degree of certainty of publication date than is afforded to the average journal this approach is limited in its use. In the US there is a provision for an inventor to divulge a non patented piece of IP to the public domain through the request of publication to the Statutory Invention Registration which is maintained through the US Patent Office. The requirements are minimal and benefit from registration within recognized patent classes which in turn improves the likelihood of an examiner finding the disclosure however the registrations are not anonymous. The original intent of the registration was to allow companies who had given up on pursuing patents a means of ensuring freedom to practice. Since 1999 in the US all patent applications are published into the public domain once 18 months have passed from date of application. Effectively this allows a company a means of creating prior art simply by filing a patent application and letting it lapse. This approach benefits from having a high likelihood of being discovered in any subsequent search procedure however it cannot be anonymous and does require drafting in the form of a patent which means that the initial filing costs to a company are not offset significantly. Defensive publishing and Osmotic Innovation. 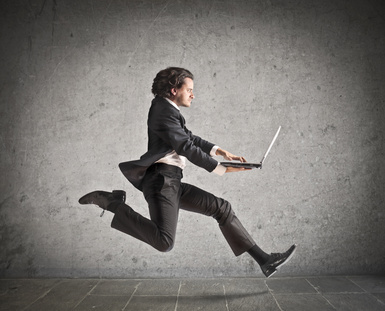 The burden of IP management on a corporation’s innovation program is often significantly large. Producing the data sets that support patents often goes well beyond feasibility evaluation and takes many people out of the core creativity roles they are hired for. 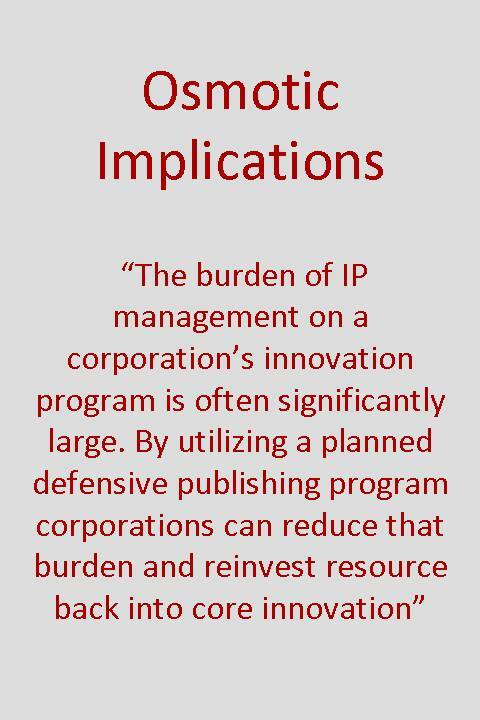 By utilizing a planned defensive publishing program corporations can reduce the burden of their IP portfolio and reinvest that resource back into more value added activities. As part of your innovation management program, defensive publishing is a must. This entry was posted in Innovation challenges, Portfolio management, Thinking and tagged Idea management, Innovation portfolio, IP, Legal, Patents, Strategic publishing.